Listen, Das Reich wanted to come with us. We told them, No! Go home, but they followed anyway. Das Reich does what it wants. As far as the Cav unit... AGS directive #7E states: Permission? Ain't nobody got time for that. We blame the miscommunication on some new hires due to excessive furloughs in AGC. Our new man. A Col.Clink? Yes, that's it. He says his men saw nothing, NOTHING! Status: offline AGN north general was too drunk, after... party... to sent proper order so i replace it this turn. We are waiting now supreme general to stamp the turn and it will be ready. AGS directive #7E states: Permission? Ain't nobody got time for that. Timmeh is wrong - I looked it up in the regulations book. 1. No soviet resupply of partisans before turn 10. 2. Naval invasions and paradrops ARE allowed. As for paradrops, there are two limits. b) Only one target (which may consist of several units dropping in several connected hexes) per 3-month period. Basically the idea is not to exploit this feature, while at the same time forcing the German player to take the threat of paradrops into consideration when it comes to rear-area security units. 3. No Finnish units may move outside the no-attack-zone unless Leningrad has been captured by Germany. Soviets have indicated they nevertheless will garrison the no-attack line. 4. No unit may deliberately move forward into isolated status (defined as being more than 99 MPs from a railhead). Units that are isolated due to being surrounded may only move towards supply. The only exception to this rule is air-landed units which may move in any way. This may have the common sense interpretation that it applies only to clear weather and not from partisans cutting rail lines. 5. The game is supposed to be fun and historically plausible, they players agree to play accordingly and not try to exploit the game engine or do ”gamey” stuff. 6. If one side feels there is a violation of rule 5, the issue will be discussed and decided on a case-by-case basis by the two commanders. These house rules have implications for strategy. House rule 4 in particular necessitates a broad front strategy - probably best for a team game. This also has been described as the "no Leningrad capture on turn 6" rule. It reduces the potential, and so use, of HQ Buildups, air fuel drops etc. Potentially it could see a successful Axis advance stop dead 100 mps from the railhead facing empty space even with fuel tanks full. But this does not necessarily improve supply/truck use and so on. Being isolated means no trucks for supply at all, and no replacements. Being always in supply means trucks are used at the longest distances always and replacements are only choked by setting maximum ToEs. And in 1942 it means concentrating in one sector is less effective, and deep thrusts to Baku or Astrakhan impossible. Finally house rule 4 interplays with house rule 3. The Soviets could be confident there will be no "right hook" at Lake Ilmen while it is too far for supply. And even if the Germans could get to the Svir this alone would not activate the Finns, German panzers would be on their own there. And winter would be close. With no "right hook" the Soviets can concentrate just on defending Leningrad proper - and "no Leningrad on turn 6" means they will have plenty of time. Leningrad in particular looks more difficult in 1941. On the other hand it does reduce the risk for the Axis. A "spectacular" for the Soviets in the winter of 1941 would not be as catastrophic as they would hit the same hard constraints, as would the later war Soviet steamroller. It may also increase the importance of rail lines and rail repair later in war, especially where they are sparse in the East. Strategic cutting of rail lines could be as important as manpower or industry. We hope to do a retrospective after Barbarossa on the choices we made, and what were the consequences. Twenty nine units in Bialystock pocket including at least five motorised divisions. Nine further units pocketed west of Minsk including at least two motorised divisions. Centre was covered by our North commander lowsugar this turn. A large pocket between Lvov and Kremenets with 21 units including 10 motorised. Eight units in the Kovel pocket including three motorised and five more south of Brest-Litovsk. A further ten are in a salient on the Hungarian border including two mountain divisions. 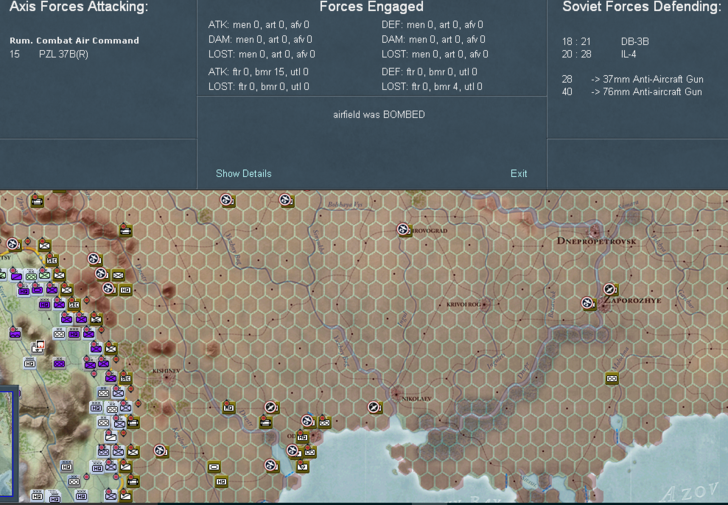 Armies on the Rumanian border will remain frozen next turn. Status: offline I have invited the Soviets temporarily to our AAR. It was to discuss our team protocol, and tut at Timmehs shameless behaviour with Das Reich. There will be a delay before their arrival, so any objections say so before then. I thought this better than reposting elsewhere, and all our screenshots, secrets etc are still in dropbox. But if wrong I am to blame. Status: offline No problem !!! They can admire an envy our rightfull and efficient organisation as they want. Status: online Impressive planning so far, it will be interesting to which extent you can use it in praxis. Obviously the Soviet team which hasn't collected experience in Poland, Norway and France isn't that well organised, but we will improve. The small pocket south of Pskov was a result of lacking communication between the Soviet northern and the central front. Despite this, the Red Army was the first in the world to use the revolutionary "dropbox" system, which got copied by many armies. Protocol will be the destination rather than starting point - we know where it is when we need it! Status: offline Soviets have decided not to capitulate in awe of the Axis - so this AAR will continue and Soviets are barred. Creating pockets has been prioritised over clearing rail repair lines for turn 2. Three divisions over the Daugava and one or perhaps two more almost, with those Soviet airborne not likely to survive to see Guards status. Eleven units pocketed in north including at least two motorised divisions. Riga not captured. RIGA – CULTURE CAPITAL OF THE BALTICS! Riga offers dynamic cultural life. RIGA – AN ARCHITECTURAL PEARL! 800 year old Gothic churches, medieval buildings, exquisite Art Nouveau, and wooden buildings. RIGA – CAPITAL OF GASTRONOMY An astonishing combination of tastes, taking you on an exciting gastronomic journey. RIGA – PLACE FOR ACTIVE HOLIDAYS Parks for jogging in summers and skiing in winters. RIGA – CITY FOR BEAUTY AND WELLNESS One must enjoy a traditional Latvian bath! RIGA - CITY FOR DRUNKEN STAG PARTIES Thankyou Ryanair! So why oh why do so many AARs go on about taking Riga turn 1? This means Panzers in urban street fighting after a river assault or a long detour East. And for what? A port that cannot supply until the Baltic islands are taken, i.e. when the rail repair has already gone past. A level 2 fort city is not going to be an Odessa, a Sevastopol or a Leningrad. At best it is a job for rear infantry. Even if it can hold on, it will be isolated when the Baltic islands are captured. So why oh why capture Riga on turn 1? So why oh why capture Riga on turn 1? It's one of the great mysteries of the WITE universe. It can't be explained. Status: offline In my opinion not capture Riga on turn 1 is a big mistake... If you capture Riga on turn 1 you can make a much stronger and continuous line across the Daugava river, and the encircled units can not escape, even the tank units. And it's not that hard to do... just use a panzer division across the river and put it next to Riga with 3 support units... Riga can fall with only one hasty attack. Ah that is interesting. I started playing on v1.04 when that would have cost 3 points on turn 1 - too much for then. I think now on v1.10 it costs nothing, or at least it is 3 on the balance sheet to unassign them later. Which certainly changes the costs and benefits equation for taking Riga. I guess it still means a panzer rather than motor infantry, which takes it away from going towards Pskow? But would mean it could be used for a dash to Talinn and supply. Something we need to ponder for our next games - I need to update my mindset to 1.10! Perhaps one of the great mysteries of the WitE universe explained. Status: offline You don't need to take the panzer division used to take Riga away from Pskov... just need to be patient. The weakest motorized division available in the north should have been sent to take Ventspils,so no Soviet divisions can route away instead of surrender. Then in the second turn clear the pockets only with infantry and no air support... if you don't clear them completely don't worry, the Soviets units trapped can wait. Then you use your planes first for airfield bombing... destroy as much as possible Soviet fighters as they will become very dangerous. Then you switch them to ground support and unit bombing if necessary. About ground units, you can go with all your panzer and motorized divisions to Pskov and forget Tallinn. Leningrad is usually very strong, so you will need all the strongest infantry divisions with support units, uninterrupted airfield bombing and a strong ground support to take it, plus two panzer or motorized divisions from 3rd Panzer Group. And don't forget to put the best infantry generals there, Model for the 1st Infantry and Balck! How many planes did you destroy in the first turn? Status: offline lowsugar snapped up Model with his first points spend for I corps! In my solo games I used to assign Model on the approaches to Lgrad, but of course having him there from the beginning means his ratings are there for movement points etc. all the way. Were you thinking Balck as a corps commander in 18? I went back to our turn 1 start file and saw that as a corps commander it would cost 27 points and need a promotion. I think on earlier versions that did not happen. A whole corps from 3Pz is going North, although you'll see on the screenshot one is south of the main route to Pskow. In version v1.04 you could take Talinn on turn 2 and ship infantry divisions there on the same turn - but that is not possible anymore. And I think the other team might not accept that as historical? I guess Talinn is too far to be a useful supply source over rail routes anyway. I am going to do a post for each SubCommanders area and then a fourth on the air war - it'll include the air tallies for the whole front. It'll be good to get your feedback. But were you thinking of just the air tallies from the Northern operations? Status: offline I think Balck is wasted as commander of the 18 Corps... It's better to make him commander of the X Corps or another one of the 16th Army in which you can put all the support units you can find there. The good commanders are better in my opinion when they command the divisions directly. It will be interesting to have screenshots of the whole situation and of the air war of the whole front. It's usually better to destroy not less than 5000 planes in the first turn. There will never be an occasion like this to destroy planes, and the more the war goes on the more the Soviet planes become dangerous. For information only - team allocations and submissions for turn 1 attached. Going South to North this turn. Nine ground interdictions during the Soviet phase. 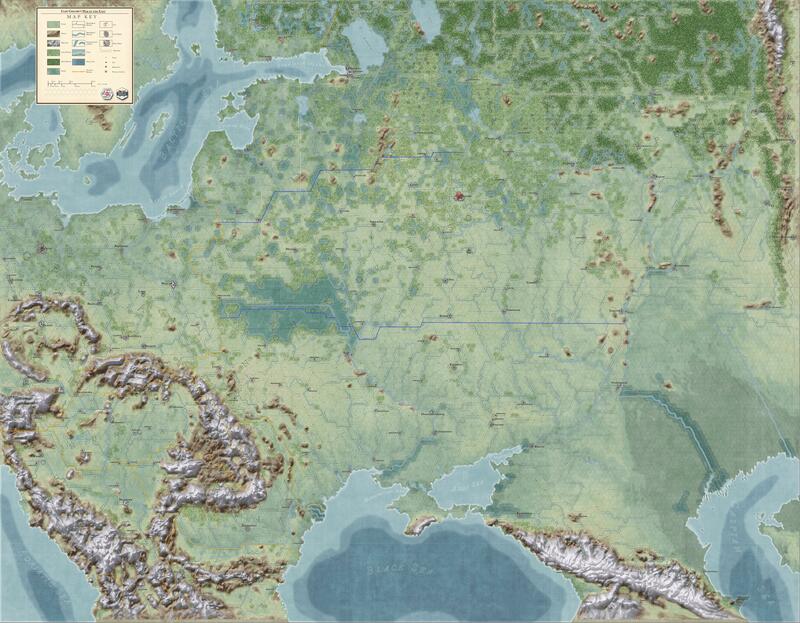 The pockets east of Lvov and in the Carpathians closed plus some more in the Pripet marshes. Motorised surge to Kiev leaving a wide avenue of hexes in our control. Soviet air activity consists of a solitary ground interdiction. But our first disaster. Our strategy was to leave the forces on the Rumanian border still frozen this turn. We now know it was not. By the manual it should have. We believe it was hex 51,89 that did it. The manual says hexes east of 51 - not including 51. Readers of the manual beware! Cue expletives from the South Commander. In the Soviet phase we get six ground interdictions. In turn they bomb the forward units of 4 panzer group. And an infantry division of Finland! One of my front commanders used the airforce without permission. He is now on his way to Siberia. I even caused major foreign policy problems because I bombed the Fins with the airforce. Well if you are going to be the badboy you should really go for it! I am sure they will be very understanding. More pockets on the Daugava with 9 units including an entire airborne corps. Paradrops are allowed in this game, but dead paras do not drop - or become guards. At the very least Soviet options will be narrowed, and Axis need for covering them lowered. Only one Soviet ground interdiction. The Soviets have concentrated at Pskow and south from it along the Velikaya river, but further South and West looks very empty. Only 1 infantry division is accross the Daugava though. 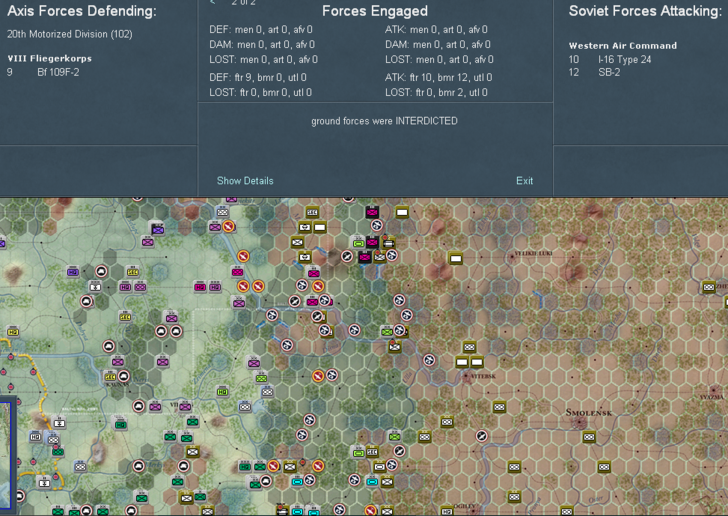 And Soviet hold outs remain in Riga and Courland. lowsugar calls this his sluggish moves, leaving his team mates very scared to know what his quick moves are. Luckily it leaves our Soviet opponents even more ruffled. The small pocket south of Pskov was a result of lacking communication between the Soviet northern and the central front. Some comments on my part of the fronts (Leningra area): ...Unluckily, the Panzerkorps surrounded my defenses from the south where I had a weakspot-lesson learned. But at least the Germans did not cross the river at Pskov, which will be sold as a minor victory to the STAVKA. Quite a lot of ground interdiction in the pockets during the Soviet phase - but only two outside. Two large pockets consolidated and motorised reach the Berezina. Only four Soviet ground interdictions with low numbers of SB-2s and I-types. So fan requests for Stelteck to do our AARs here! It would be easier to speak about the turn with less turn differences between the AAR and the Real time. I'am not sûre to remember a lot of what i did turn 2. The forums have a lot of advice on Axis air operations on turn 1, but I have never seen a turn 2 guide? From my experience and reading on the forums the Axis have more reconnaisance planes than they could ever use, but later on could particularly have more fighters. The Soviets on the other hand never threw anything away. The 5 year plans had made some good airplanes but a lot that was obsolete in technology or down the wrong doctrinal path. This can leave them with shortages of modern planes and in areas such as long range reconnaisance. Plane for plane the Luftwaffe can beat the Soviet Air Forces, but sheer weight of numbers of Soviet production can overwhelm the Axis. But if the Axis can segment the air war in to different air wars, it may be able to win some of them..... but that is for later. After the turkey shoot known as Axis turn 1 there are several possible ways, that I know of, for the Soviet air force to go in turn 1.
iii) Sacrificing the airforce to slow the Wehrmacht. The many SB-2s at the beginning in particular will be flying interdiction missions to knock MPs off the advancing panzers. They are vulnerable to bombing themselves and being overrun, and so are sacrificial pawns to slow down the Wehrmacht just as much as rifle divisions at the front are. Fighters can be posted with them to slow the destruction of the interdiction bombers, leaving themselves in turn as sacrifices. iv) Ground bombing the panzers. A variant of iii where the aim is not to reduce MPs but to reduce the ToE of advancing motorised divisions. The effect is small but cumulatively can be great. Well the Soviets have certainly not put their air force in to reserve, turn 2 reconnaisance finds them in bases everywhere. This includes reconnaisance and level bombers types which are not being used, and airgroups with no ready aircraft at all. Only in the north are there examples of aggressive Soviet air action of types ii) and iv) The Finnish attack is on infantry. Finnish fighters did not react and the Soviet team were very sporting in reporting this as a bug in the forums. The infantry, which will probably only be picket guards north of Leningrad on the no move line, withdraws on turn 19 and so is not much of a priority. Whether this was, could be or will be a cost effective way of training the Soviet air force we shall see. Similarly there were only 8 other ground bombings on 4 hexes all targetting the 4th Panzer Group. Even without fighter interception SB2 losses seem high. Perhaps waiting for Soviet air morale and experience to increase first would help. This far west the modifiers on replacements in German units are the least restrictive they will ever be, and this early will give the most time to make them. So the brunt of these attacks will fall mainly on manpower and equipment pools rather than the motorised units themselves. The cost benefit ratio of Soviet ground bombing on turn 1 does not seem advantageous. But 9 ground attacks is a small number so these are probably early ranging shots testing for when an all out air campign begins? The Soviets achieved five ground interdictions in the centre and north (plus one other in South outside picture) during turn 2. These all occured south of the ground bombing which may be because interdiction bombers in the centre were less fatigued from not having to do any ground attacks. Stelteck, lowsugar and Timmeh will know how many MPs were lost - but I assume few. But the cost to the Soviets seems far more moderate - and at least gave German fighters some fatigue in getting them. Given the choice of ground bombing in the Soviet turn 1 action phase or being left fresh for ground interdiction in the Axis turn 2 action phase the latter looks a better use. These are all good Soviet tactics and have large cumulative effects over time. But have the Soviets started precipitously? With Axis playing ground support only with fighters, and the Soviets either doing the same or no ground support at all, the skies over the Wehrmacht were eerily clear in Axis turn 2 otherwise. Our team play protocol calls for the SubCommanders to do ground unit bombing missions but only 3 were carried out and all in the South - so the Wehrmacht obviously feels they do not need the help. So the Luftwaffe can concentrate on its war with the Soviet Air Forces... but that will be presented with multiple turns together at a future date. As requested by PM - screenshots of how staging bases were used earlier on in the game on turn 2 - here they are combined with being forward fighter bases. Bases with heavy aircraft such as bombers never leave rails. Soviet airbases are stacked and grouped together around Pskow. Stacking reduces the opportunity for bombing to 2 per hex for up to 3 stacked airbases, rather than up to 6 for 3 airbases in different hexes - although arguably bombing is more effective the more aircraft there are in a hex. Concentrating airbases in hexes next to each other allows for mutual assistance with AA fire (perhaps Pskow also has attached AA SUs), air HQs to be near several of their bases at once, and close Soviet fighter interception coverage - but it also allows a staging base to economise on operational miles flown to bombing these local groups of airbases. The battle results indicate little impact from AA fire or fighter interception, so perhaps a dispersal strategy of keeping airbases that are on different hexes wide apart to increase operational miles flown by Luftwaffe bombers would have been better right now. As it is it is in easy German fighter range, and not only can level bombers fly there from a railhead, by using the fighter bases as staging bases the operational miles flown are minimal. Optimally there should be an empty airbase further forward to stage both fighters and bombers. Still at this period the Soviets are offering escorted concentrated bombing targets at very short operational range for bombers on railheads. Added to this the targets contain mostly ready aircraft of our priority models. The I16s and I15s have been mostly sorted to bases on hexes which will be left alone. It seems designed for optimal German bombing impact. 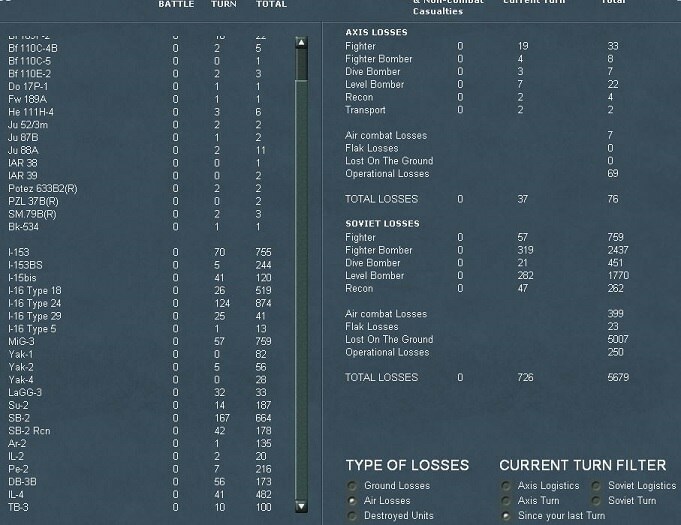 IFK alone with 378 ready level bombers bags over 300 kills from just over a dozen bombing runs, mostly of good models, and many more are damaged too. It is worth presenting another example. The airbase near Zaporozhye has not been moved by the Soviets even though they had the opportunity to do so - it is not frozen. It has good airframes- they have not been sent to national reserve or air transfered elsewhere. And it has no fighters there or anywhere near. If any of these criteria were untrue it would probably not be worth the fuel to bomb. Flying unescorted day bombing raids is usually a waste. Leaving good aircraft on a base with no fighter cover is an invitation. Given some of these opportunities it was worth delaying some of our airforces own reorganisation, rest and recuperation for future turns. Our opponents include very experienced players. So either the Soviets are about to reveal amazing new tactics unknown to me, they have gone aggressive too early or they have been caught napping on their airforces for a second turn - perhaps a combination of all 3. The kill ratio is 20 to 1 with Soviet losses skewed to modern airframes, although half our losses were fighters. And this ratio will be higher when damaged planes are written off when their airbases with bombed support are unable to repair them. At least in my experience this is a good tally for Axis turn 2. Or are these famous last words? For information only - team allocations for turn 2 attached. Soviets manage to break in to our pocket delaying their destruction for another turn. 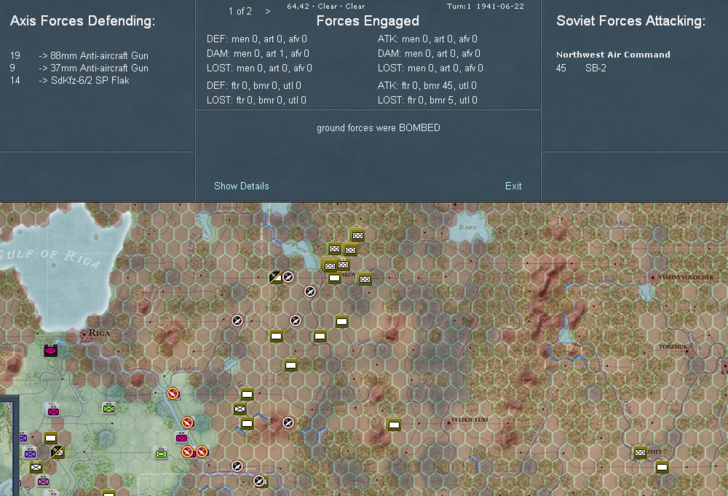 Soviet turn air activity is just four recon missions near front, as they move their airbases to behind Novgorod. Their shorter range airframes such as I16s are now completely out of range of the front. However we only achieve 3 ground interdictions of our own. We reestablish our pocket south west of Pskow including the airborne brigades and clear out the remaining hold outs in Riga and Courland. Right now we need our infantry to catch up but only one infantry division is on the front line. Looking back we were probably a bit lax about our unguarded HQs near the front. The Soviets reinforce the Berezina line and offer no aggressive air activity. Their nearest airbases are at Rzhev, Bryansk and East of Vyazma - out of range of even their medium range airframes which nevertheless remain on the map. Most of our eight ground interdictions are in the landbridge west of Smolensk. A turn of consolidation. 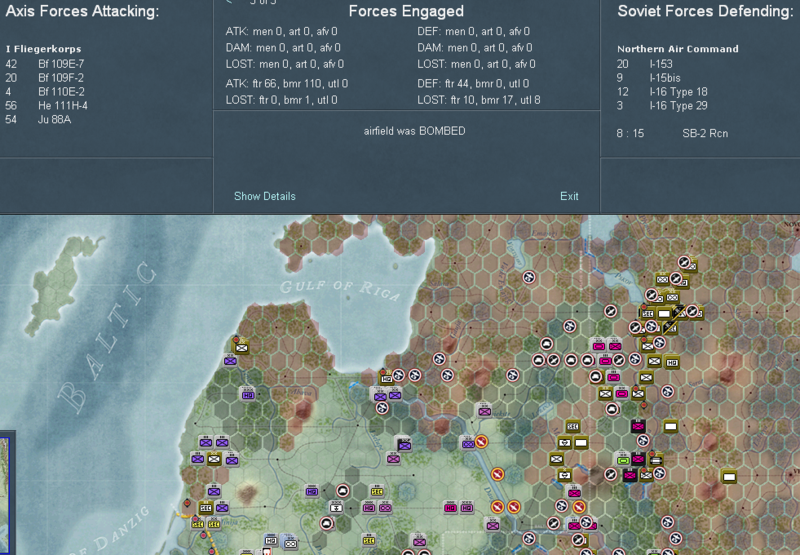 The Bialystock pocket is finally reduced but pockets around Minsk have to be resealed. The first infantry division arrives on the Berezina where all our motorised are. The paucity of Soviet Units north of the Berezina and South of the Daugava is matched by our own.